We get asked many questions, and over time we've created several FAQ pages for the game, development practices and certain web presences. This page collates all of them, along with links to the official versions. The official versions are likely to be more updated. These can all be found on the FAQ page of our official website. Thrive is a free open-source game for PC and Linux about evolution, in which the player guides a species from their origin as a microbe to the space age and beyond. Gameplay is split into seven stages – Microbe, Multicellular, Aware, Awakening, Society, Industrial and Space. Through each of these you will guide your creature towards intelligence, sentience and the stars. Our team seeks to accomplish two major goals: create engaging, compelling gameplay that respects our players’ intelligence, and remain as accurate as possible in our depiction of known scientific theory. Wait, isn't that just Spore? Sounds fun – where can I download it? This is just a simple cell-simulator – where’s the epic evolution game I was promised? We’re Revolutionary Games, an independent open-source game development studio comprised of volunteers. You can read more about us individually here. Generally, we’d prefer if you contacted us by posting either on our community forums or subreddit. We have a contact form here if it’s a more private matter. As an open-source team, we’re always looking for more people to contribute any amount they wish. Visit our Get Involved page to learn more. Why don't you use Kickstarter or some other source of income? Believe it or not, we’d have nothing we would want to spend the money on. We develop this not to make a quick buck, but because we want to develop this, and that makes sure people here are people who have time, commitment, and a natural interest in the project. Plus, dividing money up between a constantly changing team of people whose contributions can’t always be quantified is one challenge we don’t want to face. Thrive was founded on the principle that voluntary contributions can make a game of this scope, and we continue to abide by it to this day. See Money and Thrive for more detail. An in-depth look at the functionality of the Microbe Stage can be found here. For instructions and controls for the latest release, see its release notes on the Releases page, while for an overview of the planned game in general, visit our Wiki. n-game NPC evolution is based on a system known as CPA – organisms collect, compete for and process Compounds (C) in the environment; based on their effectiveness, Population Dynamics (P) controls how successful they are through a variety of simulations; and Auto-Evo (A) takes hold, using automated algorithms to calculate how a species will evolve each generation. Your own species is slightly different, as you control their changes through entering the editor each generation to make small changes. The player will still collect Compounds, and their overall species success is still governed by Population Dynamics. What about the society stages? Evolution is no longer a factor in the Society, Industrial and Space stages – this is instead the realm of the Tech Editor. Technologies can be discovered to gain access to specific Function Parts (FPs), which can then be attached in different ways to build whatever you can think of – buildings, vehicles, weapons, even chariots drawn by organisms from your planet if you so choose. Can I play as a plant? In our current concept, yes. You will be able to play using the same evolutionary system as animals, though your options will be limited, including the ability to achieve sapience. Can I play as an aquatic species? As in Earth’s history, aquatic species will be the dominant species on a planet for the first part of the game (and if you ask a marine biologist, they’ll be dominant forever). On some planets, there will be no land at all, so you will have to stay aquatic, though the intention is for initial planet settings to be decided at the game’s start, so this won’t happen unless you want it to. Where can I find a gallery of your art? We have a gallery filled with just some of our concept art and game screenshots. More can be found on our DeviantArt page. I have a really cool idea for the game – where do I put it? This project has been around for a while, so we’ve discussed a lot of things. You might have a really cool new idea, but 90 percent of the time that’s an idea that has already been discussed. If you’re still absolutely certain we haven’t covered your suggestion, please post to our subreddit first — if the idea warrants further discussion, it can be brought up on our development forums. Please note that ideas with little gameplay value or no scientific basis are extremely likely to be immediately refuted, so think twice before suggesting space-faring microbes. What will the game be rated? Since we are a non-profit community, we cannot pay to be rated by PEGI, ERSB, etc. Be warned, though, that natural and war violence will feature to an extent, and sexual references in nature will also be present, though these can be turned off in game if need be. Will the game feature multiplayer? While the possibility of a fully multiplayer-oriented game is incredibly unlikely due to the vast scales of each stage and the time discrepancies which divide them, social interaction will still be possible. Players will be able to exchange save files (along with custom organisms, technologies and all manner of other creations) and challenge each other to survive on desolate planets, create brilliant technologies, or simply touch-up an organism that could be a little more beautiful. At some point single stages may be converted into multiplayer variants in which players may compete or co-exist in an environment to discover who can wield the forces of evolution more effectively, but don’t expect too much development here until most other features have been ironed out. Are you planning to make more games? No, at this point Revolutionary Games is entirely centered on the development of Thrive, and the suggestion to create anything else, while potentially attractive given the unique open-source nature of the project, is irrelevant. The seven stages will effectively be separate games anyway (though we’re aware of how Spore’s attempt at this created stages which felt too much like mini-games, and we have concepts in place to ensure this doesn’t happen again). Perhaps you like the idea of Thrive but would prefer a different approach — if so, visit our friends at Species: ALRE, another evolution-based indie game where you observe and indirectly affect evolution. Where did this project begin and how has it evolved? Several years ago (2009 to be exact), a topic was posted on the Spore forums detailing a game called Evolutions! with screenshots showing ultra-realistic graphics and an organism editor with much more flexibility than Spore’s. It was later revealed to be a hoax, created to convince EA (Spore’s developers) that they had competition, supposedly inciting improvements to Spore. However, enough people were interested to start a small development team, with the thread’s original poster as its leader. Soon it became apparent that the team in place didn’t have the necessary administration to run effectively. A small group consisting of people who had the skills and determination to make a realistic evolution game broke off, and Thrive was born. The open-source nature of the project has meant only a single founding member is still with us (~sciocont), but plenty of skilled newcomers have arrived to take the place of those who leave. 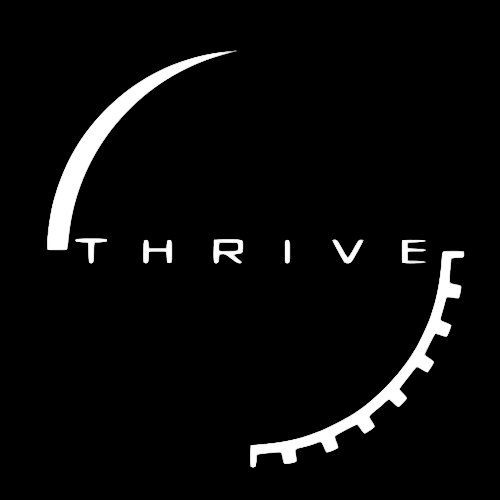 For much of Thrive’s development, little programming work was done, a lack of coders meaning conceptual work was favored. By mid-2012, so little concrete development was visible that the only remaining programmer left, believing the project was too ambitious from the start (an understandable sentiment, if you ask us). However, the team worked to reverse the situation in only a few months, aided by a Reddit post in early 2013 which saw 30,000 visitors to the forums in a single day. Since then, work has progressed, like the proverbial tortoise, in a slow and steady manner, with increased organisation and a growing internet presence. At the time of writing, the release of 0.2.4 is fast approaching, to be followed by an outreach initiative to attract new members and grow the team, hopefully leading to faster updates and more progress. The full Microbe Stage is still some way off, but most of its core systems have been thoroughly planned, only implementation and assorted balancing remaining. Once we are happy with the stage as final, we will move on, beginning work on the Multicellular Stage. You can read a more detailed account of the project's history here. There's no chance of this ever being completed, so why are you doing it? Along with the conundrum of the underwater civilizations, this is undeniably the most frequently asked question we have. Each of our team members has their own opinion on the matter, so a single uniform answer isn’t possible, and in the context of visible progress so far, many are justified in believing that the full game will indeed never come to fruition. The team formed out of a uniform desire to create an evolution game better than all which came before. Spore was, for many, a huge disappointment – after promising the epic tale of an organism’s grand rise from cell to space empire, all it delivered was a set of limited, scientifically inaccurate mini-games. Admittedly, it’s still fun (many of us still play it to this day), but it’s certainly not what EA promised. Revolutionary Games’ goal is to find out where Spore went wrong, fix its shortcomings, improve upon it as much as we can, and ultimately give the world the game it was denied. Yes, we are well aware of the risk; the possibility that, despite its lofty ambitions, the project will fizzle out has been a constant thought in all our minds. We seek to accomplish more and have less capacity to do so than some, but each of us has the motivation and skill to succeed, and so far, despite the adversities we’ve experienced, we’re still here, incrementally drawing closer to the game we hope is possible. Installing and running the game can be a challenge at times, so we've provided some Installation FAQs (also on their own page here). If you have any issues, post to our community forums or subreddit. You must unzip it and then you'll get a folder. In this folder there should be one called "bin." In here there should be a file called "thrive." Double click on this and Thrive should start. I open the file but it asks what to run it with? You probably have a "rar" zip file. In that case, you must install winrar. Go to http://www.rarlab.com/rar/wrar521b2.exe and it should allow you to right click and extract. It tells me some files were modified, if I want to move them to archive and the screen goes black when I choose a render to use. You probably haven't unpacked the zip file. You need to make you extract the file first. Most of these questions come from stickied threads on our development forums. Why can't I sign up for the forums? Our development forums can only be joined by invitation, which we handle through our Application Process (the reasons for this system are explained at the link). We also have a community forum, which requires no application to sign up for. If you see the word Belgium somewhere odd, it's because of a reference to our old forum's censorship. When members attempt to use profanity, our old forum would gently nudge their foul mouths in a more correct direction with this charming Douglas Adams reference, and we've stuck with it despite the lack of an editable censor here. Self-censoring is the Belgium. I don’t understand some of your jargon (PPG, FP, etc.). What do you mean? These are part of our forum lingo. It's necessary that we use these to save our fingers from breaking from typing too many things. Meanings for most if not all of these things can be found in our Thrive Abbreviations Dictionary. QFT is short for "Quoted For Truth" (see Thrive Abbreviations Dictionary). Some members use it after they have quoted someone to show that they agree with what that person said. What are team leads? How do I become one? Team leads are members in charge of knowing everything about a certain part of the game, and are moderators on our forums. If you want to become a lead for something, you have to contribute a huge amount to that topic, and then apply for a lead position. See Team Leads for more information. Why don't you use a different engine? We’ve built our own engine from the ground up to account for all the different types of gameplay we’ll eventually need it to handle. There have been suggestions in the past to move to different game engines (such as UE4 or Unity), and these aren’t ruled out in the future but would require a lot of work to transfer to. One commonly suggested “engine” is Space Engine for the Space Stage. We have made contact with the owner of Space Engine before, and he has agreed only to collaborate ideas. As Space Engine plans to develop future projects itself, it prefers to keep its code to itself, and is not open source. The community forums FAQ is generally kept separate from everything else, since it deals exclusively with issues on the site itself. You can read the full post here, which includes rules and etiquette. For questions on forum functionality, see this page. To create a topic, enter the relevant subforum and click the ‘Create Thread’ button at the top right of the screen. Some sections will have locked or restricted permissions – ordinary users are not allowed to post here, and you will not see a ‘Create Thread’ option. When you finish writing the opening post of the thread, click the new ‘Create Thread’ button. How do I reply to a topic? You can either write your reply in the quick reply box underneath the thread, or for more options (like hyperlinks and formatting), click ‘Reply’, either at the top right of the opening post or below the most recent. Like subforums, some topics are also restricted. Most ideas should come under The Game -> Future Game and the relevant stage subforum, but be aware that Thrive has been around a while and it may have already been discussed. We also expect a certain amount of feasibility and realism for the game itself, so go nuts talking about space-faring microbes if you wish, but don't expect everything to be seriously considered by the developers. Can I ask for gameplay advice? Please do! Ideally, all gameplay-related posts should go in The Game -> Current Game -> Microbe. There you can ask questions about the game, as well as post your own achievements or just talk about your general experience. I need to file a bug report, where do I put it? Unsurprisingly, under The Game -> Current Game -> Bug Reports. Include as much detail as you can, including screenshots and crash reports. This will help us fix the issue as quickly as possible. Where do I post if I'm not sure? 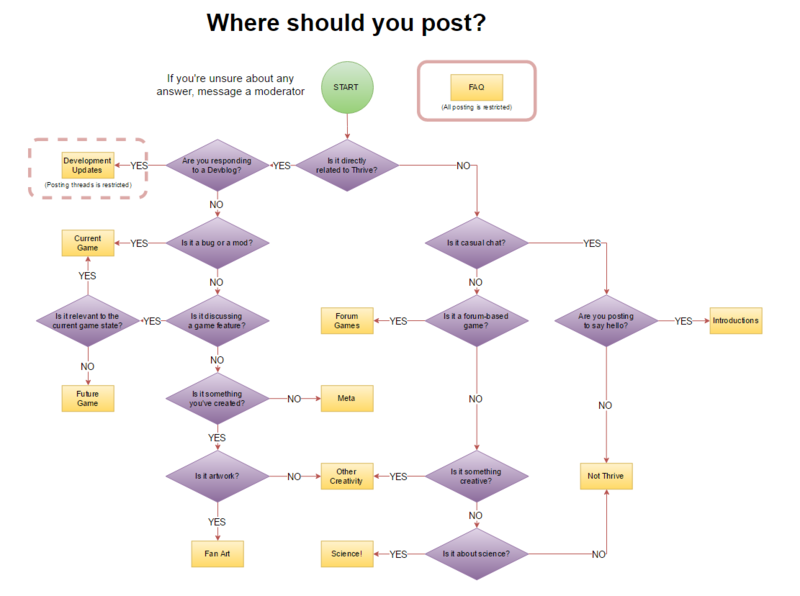 Luckily we made this handy flowchart to guide you in choosing a suitable posting location. It doesn't show the subforums, but they should be self-explanatory. Bear in mind moderators may move your posts and threads if they aren't suitable for the current board. Can I help you make the game? Can I help you organize the community? Certainly. We’re always on the lookout for prospective community managers. While we don’t need too many, we do want to free ourselves from having to look after everything here. Once you’ve been around a while and gotten to know the place, post an application in the Meta subforum. Our community managers will be responsible for answering fans’ questions sensibly, moderating the forum, relaying bug reports and interesting ideas to the devs, and asking devs directly if a more complicated scenario or question comes up. Your member rank is based on how many posts you've made, and each level corresponds to a stage in the game. Once you reach 10 posts, you will evolve from microbial to multicellular. We'll leave you to discover when the others come into effect. Why are there so many guests online not doing anything? While the guest counter at the bottom of the screen sometimes shows many guests online, it's actually due to a glitch. If a member enters and exits a subforum in the space of a few seconds, it adds a few "guests" to the counter for a couple of minutes. Even a few members perusing subforums can suggest dozens of guests are online.